No, she didn’t whoop me. Instead, she just smiled, we all got home and she then practised some magic in the kitchen, which was nothing but plain cooking as I discovered later on. The idea of turning zucchinis into fries confused my 5-year-old brain, but she was a great mom and was the one to inspire me to love cooking. Can you be allergic to Zucchinis? One thing people usually mistake for is that allergies can’t be predicted. It’s not always true. When you’re allergic to a certain food, it’s the components inside the food being naughty to your body. So, if you know that exact component, you could predict what to not eat. … there are “Bitter Zucchinis”. They are high in Cucurbitacin, a substance that makes Zucchinis, Cucumbers and Melons bitter and… poisonous. You couldn’t tell the two types apart just by the look, so it’s impossible to avoid buying it in stores. Before preparing the dish, cut out a small piece and lick it. If it’s bitter, throw it away and make sure no bitter zucchini gets near the table. Breadcrumb is no stranger to fried food cravers. You see, not everything getting deep-fried will turn crispy. What makes something crispy, after all? If it’s hard but easy to be broken, we call it crispy. This happens not only in fried food, but also in vegetables and fruits. Bite into a thin slice of apple and you’ll see. When you fry something, its moisture will be drawn out, making it harder. However, if the texture of the food is not too dense, they could be easily broken and therefore, crispy. That explains why you can’t just throw everything into the hot oil. Meat of any kinds is too dense to be crispy. Most veggies, including potatoes, are not that dense, but if they are too high in water content, they couldn’t be crispy just by simply deep-frying. That’s why we need to give them a coating layer that will sure turn crispy after frying. The coating process involves 3 steps: dipping in flour, eggs, and breadcrumbs. Flour acts as an adhesive to make the beaten egg stick onto the chicken’s surface. Egg, again, attaches breadcrumbs onto the chicken. All of that gets crispy when fried and gives the chicken a crunchy coating. However, in this recipe, we don’t do breadcrumbs. It’s panko instead. With the name derived from Japanese meaning “flakes from bread”, panko is made of white bread instead of brown bread like most breadcrumbs. And here’s the secret: panko is much lighter than breadcrumbs. 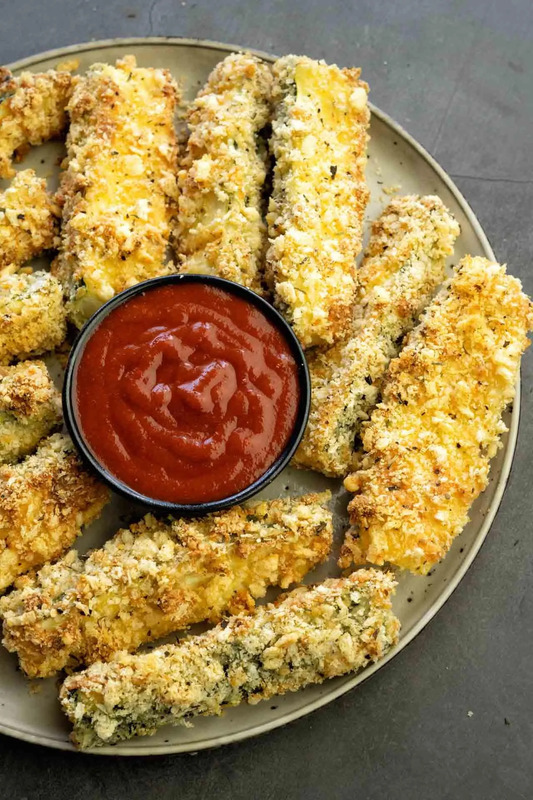 Its flaky, airy texture makes itself easier to be broken, therefore helping your Zucchini fries stay crispy for a longer period. Baking is healthier than frying. Everyone knows that, right? But is there a mystery behind frying, since fried food gets all the love? It’s hard to admit, but residual oil actually makes them tastier. Also, unlike baking, you don’t have to take the tray out once in a while and flip every individual during frying. With enough oil, every side gets fried equally and ends up goldenly delicious. So yeah, you decide whether to bake them or to fry them. Things get more convenient when you fry and get more in shape when you bake. My all time favorite is a mix of Sriracha Chilli Sauce and Mayonnaise. Its spiciness and creaminess go so well with most fried dishes. To this recipe, you could have it with a simple Greek yogurt dip seasoned with salt and pepper if you want to. It’s fries and it delivers only about 150 calories per cup? Stop that order from McDonald’s and get yourself some of these healthy, heavenly delicious fries right now! In batches, coat the zucchini sticks with flour. Dip them into eggs, then dredge them into the Panko bowl. Remember to press so each piece gets coated nicely. Carefully place each zucchini stick onto the rack. Put to the preheated oven and bake for 20-22 minutes, or until the zucchinis are golden brown and crisp. Serve immediately with dipping sauce (chilli + mayo or plain greek yogurt + salt). Garnish with parsley, if desired. Unlike fries or chicken nuggets, zucchinis will get soggy when left in the air for just 3 - 4 minutes. I recommend eating them right after being taken out of the oven for the best experience. Yes, mozzarella goes well with fries like eggs and bacon. Go wild once in a while.